Hello All – The last meeting of the reunion committee was held today, June 6, with ten people present. The countdown continues to June 19th. Everything seems to be on track for a GREAT time! Local businesses have been generous in responding to the committee’s request for gift certificates and merchandise to be given away to winning ticket holders in drawings to be held both nights. Each person in attendance will receive a ticket for the drawings at the registration table. Those classmates bringing an item (or photo) for the ‘Anything ‘70s’ display will receive an extra ticket for the drawings and entries in the ‘Anything ‘70s’ display will be voted upon both nights. We have a special gift certificate for both the Friday and Saturday night winners. PLEASE dig through your memorabilia and help make this a GREAT display of days gone by. Centerpieces, decorations, and music are under control. The menu at Moila is set and a special cake for the class has been ordered. We have a photographer booked for Friday night to take a class photo, individual grade school photos, and candid shots throughout the evening. As of now, our head count for Friday stands at 91 and 102 people have made reservations for Saturday night. Mr. Vaccaro and his wife will be with us on Friday night and Mrs. Ranner will be with us both nights. THANKS to the reunion planning committee for their countless hours spent in making this an event to remember. I’m SO looking forward to seeing you all there. Please check to make sure we've got your reservations marked correctly. Let us know if you want to add an additional night or person, change from one night to the other, or order one of the souvenir photo CDs featuring high school and grade school class photos and an assortment of candid photos from Friday night festivities. Still time to fine tune the list. Let Paul know if changes need to be made as soon as possible. THANKS!!! PLEASE NOTE: The reunion planning committee met on January 31 and decided to extend the reservation/payment deadline until March 31. We're hoping to see as many classmates at the reunion as possible. 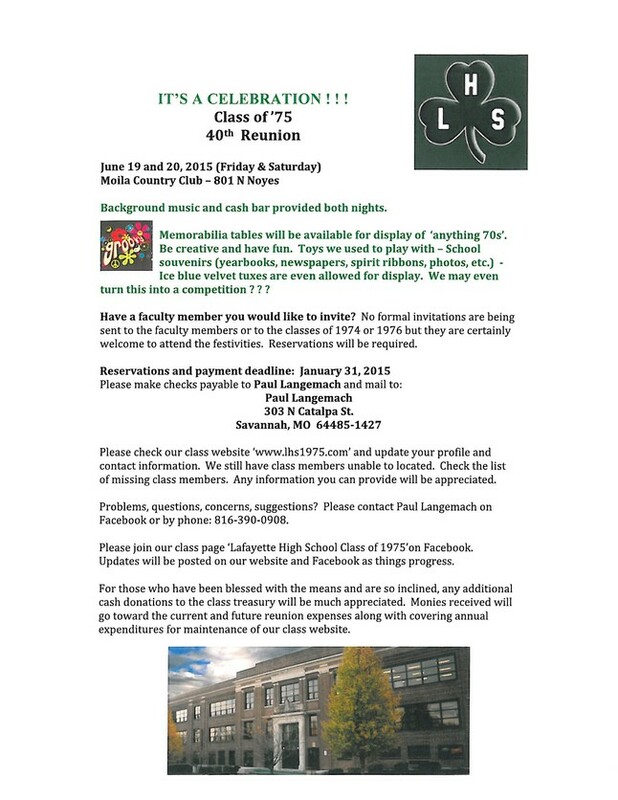 Let us know via this website or on our class page on Facebook (Lafayette High School Class of 1975) if you have any questions. See you in June!!! Celebrate Good Times, COME ON ! ! ! 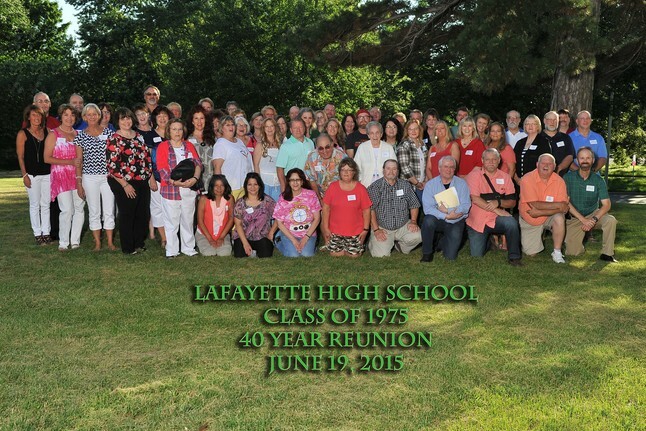 Almost 40 years since our graduation from Lafayette High School . . . I think we’d all agree we’ve got good reason to celebrate. 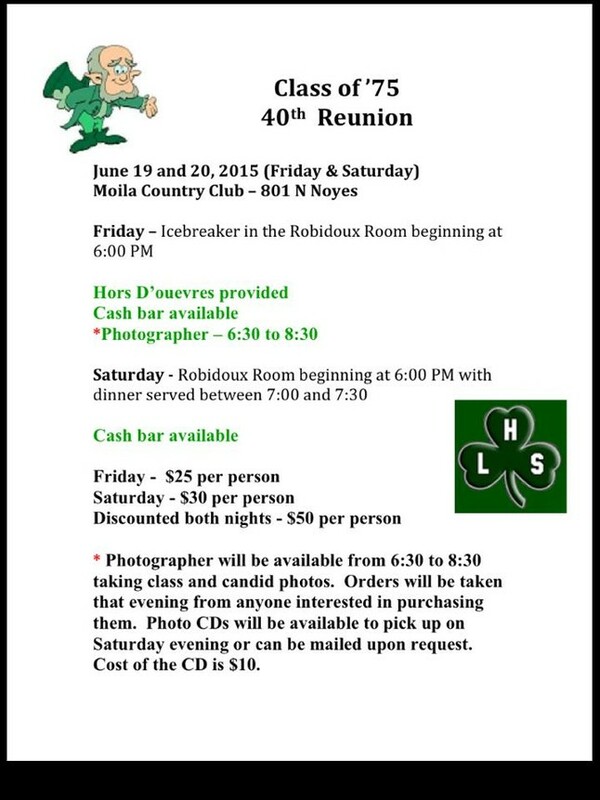 The reunion committee has been meeting on a regular basis since May and we’ve reserved the Moila Country Club in St. Joseph for both Friday and Saturday nights, June 19 and 20, 2015 for the festivities. Photographer will be there from 6:30 to 8:30 taking class and candid photos. Orders will be taken that evening from anyone interested in purchasing them. Photo CDs will be available to pick up on Saturday evening or can be mailed upon request. Cost of the CD is $10. Memorabilia tables will be available for display of ‘anything 70s’. Be creative and have fun. Toys we used to play with – School souvenirs (yearbooks, newspapers, spirit ribbons, photos, etc.) - Ice blue velvet tuxes are even allowed for display. We may turn this into a competition ? ? ? Gathering begins at the Moila Country Club, 801 N Noyes Blvd. in St. Joseph, at 6:00 pm in the Robidoux Room with dinner served between 7:00 and 7:30. Memorial display honoring those of our class who are no longer with us is being planned. Additional activities are still in the planning stages – suggestions are welcome. No formal invitations are being sent to the faculty members or to the classes of 1974 or 1976 but they are certainly welcome to attend the festivities. Reservations will be required. If you haven’t already done so, please check our class website ‘www.lhs1975.com’ and update your profile and contact information. We still have class members we’ve been unable to locate. Check the list of missing class members. Any information you can provide will be appreciated. If you have problems accessing the site, please contact Paul Langemach on Facebook or by phone (816-390-0908). 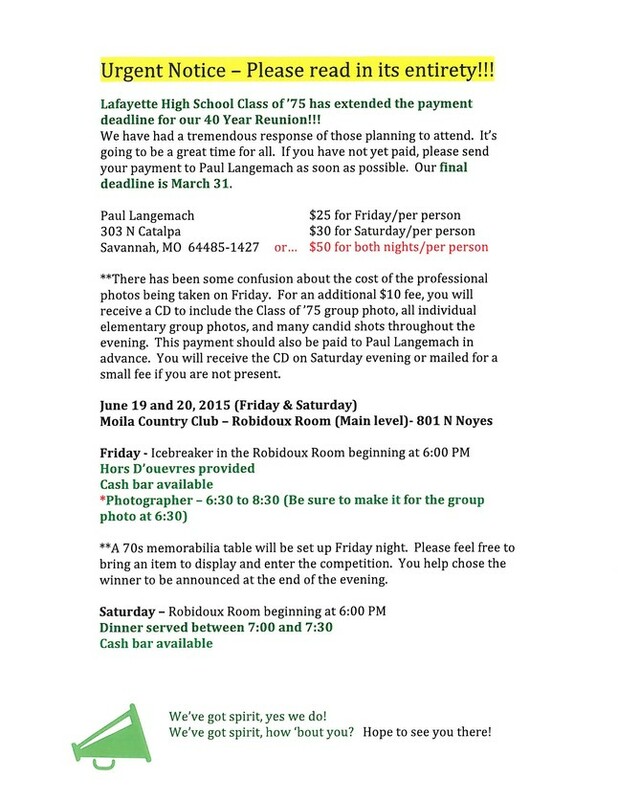 Also, for those of you on Facebook, please join our class page ‘Lafayette High School Class of 1975’ for regular updates and for notices of the next planning meeting. To save on postage expenses, we will try to keep everyone updated as we move forward via our website and Facebook during the coming months. For those class members we’ve been unable to contact by way of these two methods, we’ll attempt to keep in touch via the postal service. Questions, comments, and suggestions can be directed to the class website or our Facebook page. You can also call Paul Langemach (816-390-0908). Any additional cash donations to the class treasury above and beyond the cost of reservations will be much appreciated. No gift is too small. All donations are appreciated. Monies received will go toward the current and future reunion expenses along with covering annual expenditures for maintenance of our class website. Again, checks should be made payable to ‘Paul Langemach’. Our next planning meeting is scheduled for April 18, 2015 at 2:00 pm at the food court in East Hills Mall in St. Joseph. We welcome and appreciate your help. Remember: IT’S A CELEBRATION ! ! ! Any and all donations are appreciated. Please designate amount.